Guardian Angels HomeCare Medication Dispensing Management Solution (Personal Medication System) will automatically dispense medication and vitamins in accordance with your prescribed treatment program. This device is a low-cost, practical solution to ensure our clients get the right dose of medications at the right time. 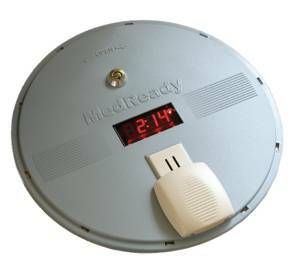 It’s Easy – When time to take the medication, the tray will automatically turn to the next dose, and a very audible alarm will sound. Quick Response to non-compliance – When medicine is not taken within 30 minutes of the prescribed time, our Care Center will be notified. Our Care Center representative will call to remind the patient to take their medicine. If the representative does not get a response from the patient, a caregiver or medical contact is then called to ensure adherence. Freedom to Stay at Home Longer – Medication compliance will help avoid serious medical issues and ease life of those chronic care management issues. Right Pill, Right Dose, Right Time – The peace of mind to no longer have to worry if your loved one missed a dose or took a double dose. 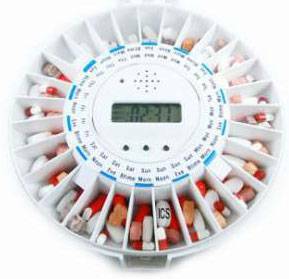 The Medication Dispenser Management Solution can pre-load up to 30 days of medication. As shown by some statistics below, properly adhering to a doctor’s prescription regimen allows clients to stay healthy and in their own homes longer.